Prime Minister Ariel Sharon on Sunday signed an order requiring 9,000 Israeli settlers to leave the Gaza Strip and northern West Bank by July 20, his office said. Settlers who remain in the areas slated for evacuation after that day can be removed from their homes by force, according to the directive. Sharon's Cabinet on Sunday began charting Israel's future borders in a historic session, giving final approval to the withdrawal and a revised route of the West Bank separation barrier that would encompass at least 6 percent of land claimed by the Palestinians for a state. The twin votes sent a mixed message to the Palestinians. An Israeli government agreed for the first time since capturing the West Bank and Gaza in the 1967 Mideast war to dismantle some of the dozens of Jewish settlements it has built there. However, Israel acted unilaterally on what was to be a key issue in peace talks with the Palestinians, and signaled it will keep a chunk of prime West Bank land close to Jerusalem, including two large Jewish settlement blocs in the area. Sharon, a former settler patron, said that "it's not an easy day, it's not a happy day," but that the dismantling of 21 settlements in Gaza and four in the West Bank is vital for Israel's security. Later Sunday, he signed an order requiring some 9,000 settlers to leave their homes in these areas by July 20. Otherwise they would face removal by force. The Palestinians balked at Sharon's go-it-alone approach but said they had no leverage to stop him. "Israel is creating facts on the ground in the West Bank," said Palestinian legislator Hanan Ashrawi. "Sharon wants payback in the West Bank for the disengagement from Gaza, particularly Jerusalem." The Gaza withdrawal won approval from 17 Cabinet ministers, including eight from the moderate Labor Party, while five ministers from Sharon's ruling Likud Party voted against the plan. The easy endorsement came just days after parliament overwhelmingly supported the plan, in what appears to be the final political defeat for withdrawal opponents, including the once powerful Jewish settler lobby. However, the pullout could still be derailed if Sharon fails to get his 2005 budget passed by parliament by the end of March. Sharon is still struggling to secure a majority for the budget vote, but his aides have said he is optimistic. "This is a historic decision, but we are facing a very difficult period," Justice Minister Tzipi Livni said of Sunday's vote and the expected confrontations with Jewish settlers during the withdrawal. Jewish settler leaders said they have not given up. Pinchas Wallerstein, one of the leaders of the council of Jewish settlements, called on supporters to begin "an aggressive and strong struggle," but to avoid violent confrontations with Israeli troops. For now, only a minority of settlers have agreed to leave voluntarily, and security officials have said they are concerned about violent clashes during the evacuation. The settlers say the expulsion of 9,000 Jews from their homes amounts to ethnic cleansing, reports CBS News Correspondent Robert Berger. Defense Minister Shaul Mofaz told the Cabinet on Sunday that thousands of troops would take part in the dismantling of settlements. The withdrawal is to be carried out in four stages, but the Cabinet has not decided in which order the settlements will be removed. A Cabinet vote is to be held ahead of each stage, but these are considered a formality. Finance Minister Benjamin Netanyahu, an ex-premier, was the most prominent of the Likud rebels to vote against Sharon's plan. Netanyahu said he feared that without a national referendum, a withdrawal would deepen the rift in Israel's society, but also appeared to be positioning himself for a run for Likud leader and prime minister. Later Sunday, Cabinet ministers also approved the final route of the separation barrier, which encompasses more than 6 percent of West Bank land, including the large Jewish settlement blocs of Gush Etzion and Maaleh Adumim, both near Jerusalem. 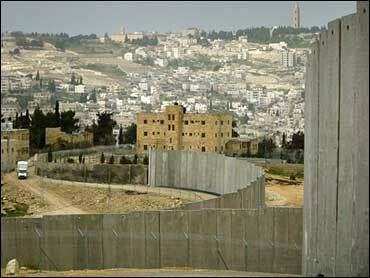 Construction of the West Bank barrier began in 2002 and is one-third complete. Israel said it needed a shield against a wave of Palestinian suicide bombers and gunmen. The Palestinians denounced the construction as a land grab, saying that Israel could have built the barrier on its land. Last year, the world court said in a nonbinding opinion that the construction of the barrier is illegal and should stop. The route originally proposed by army planners would have sliced off nearly one-fifth of the West Bank, but large segments were struck down by Israel's Supreme Court as causing too much hardship for Palestinians. By a vote of 20-1 with one abstention, the Cabinet on Sunday approved a revised path that is closer to Israel's old boundary with the West Bank. However, in the Jerusalem area the new route dips deep into the West Bank, a path that could undercut the Palestinians' attempt the establish their future capital in the eastern sector of the city, abutting the West Bank. Several Cabinet ministers acknowledged that while the barrier might have been conceived as a temporary defense against Palestinian attacks, it would also help determine final borders. "The route of the fence is significant in terms of future negotiations over Israel's borders," said Livni, adding that "the objective today is to determine the route so it encompasses as many Israelis as possible." Palestinian leader Mahmoud Abbas, speaking before the vote, reiterated in an interview with the German news magazine Der Spiegel that Israel must dismantle all settlements and halt construction of the barrier. "What right does Israel have to build settlements on our land?" Abbas said. Sharon has said in the past he has U.S. blessing for holding on to large West Bank settlement blocs in a future peace deal. Last year, President Bush affirmed to Sharon in a letter that "new realities" in the West Bank, meaning concentrations of Israeli settlers, could not be overlooked in drawing future borders. Abbas told Der Spiegel that Bush cannot determine the Palestinians' fate. "The American letter to Sharon is unacceptable because it pre-empts solutions for a final phase we haven't reached yet."